It is looking like a winter wonderland here where I live and it's taking everything for me to refrain from playing Christmas music. Snow always gets me into the holiday spirit and my thoughts have been wandering to ideas for hostess gifts and ornament exchanges this year. 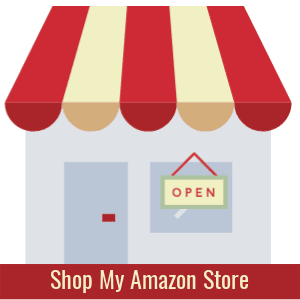 I prefer giving handmade gifts and with the holiday soirees soon approaching, I needed to come up with some ideas fast. 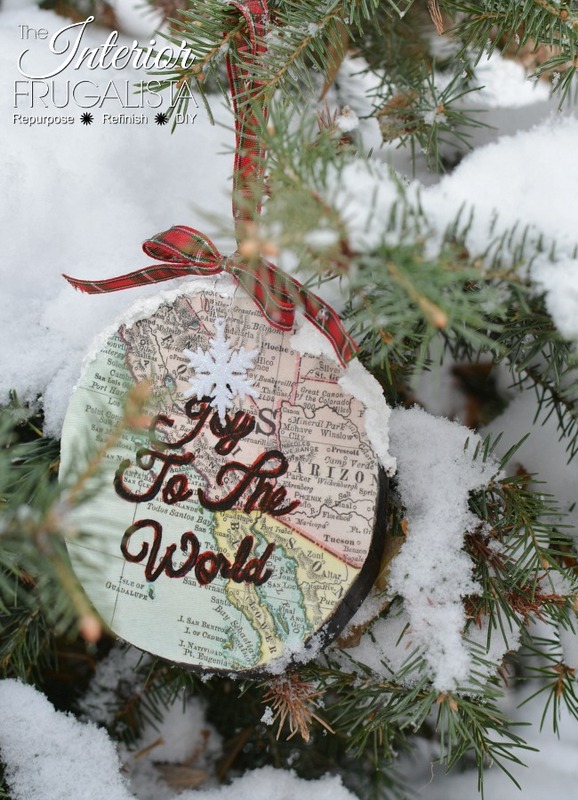 When I saw the theme for this month's Thrifty Chicks Challenge was world globe and/or map upcycles, it gave me the inspiration I needed for my handmade gifts this year with these adorable wood slice map ornaments. Tucked away in a file cabinet were leftover pieces of maps used a few years ago on a Mid-Century Modern Dresser Makeover. I found enough pieces to probably make a dozen or so map ornaments but at this point, I didn't have a clear idea of how I would make them. While killing time on his lunch hour, Mr. Frugalista found a pile of off cut treated pine posts at Goodwill for $2 each and wondered if I could put them to good use. Heck yes, it was just the inspiration I needed. 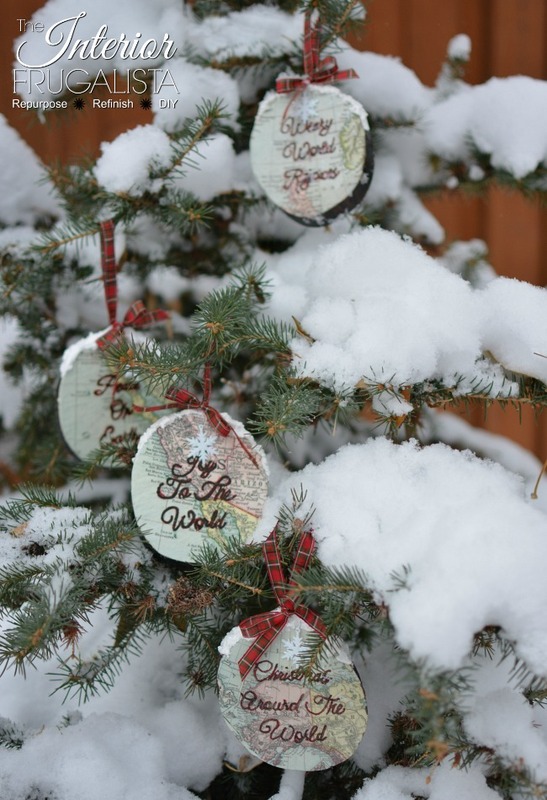 Because what I saw wasn't pine posts but rather rustic wood slice ornaments and an idea was born. 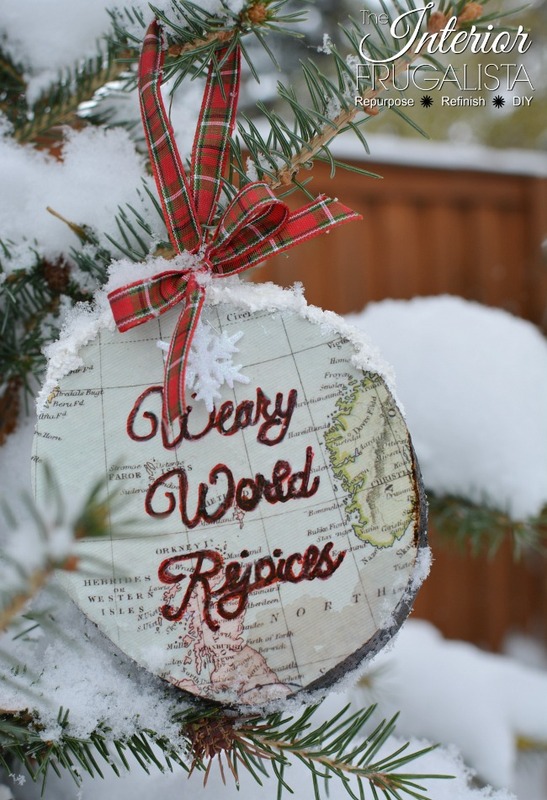 Before I get into the details of how I turned the wood slices into map ornaments, I should tell you a little about the Thrifty Chicks group. 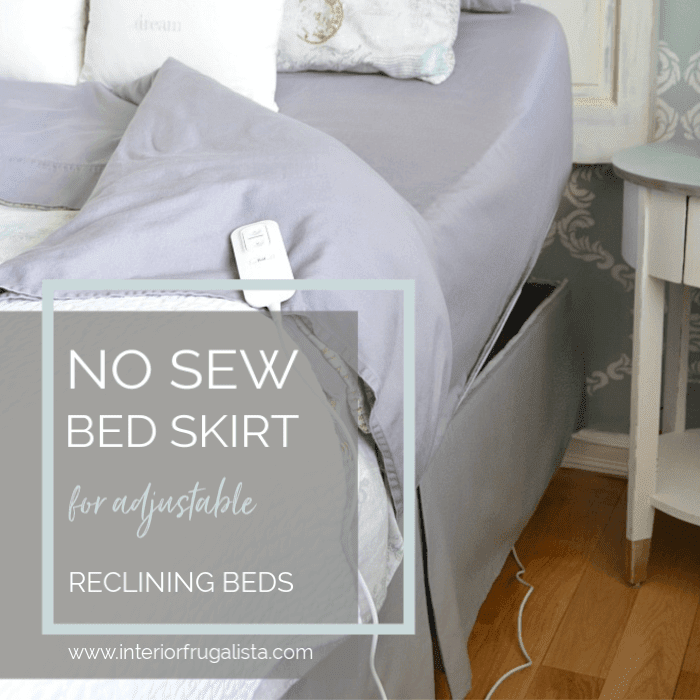 On the second Wednesday of every month, my creative junk loving friends and I come together to transform, upcycle or repurpose a junk find based on a theme. 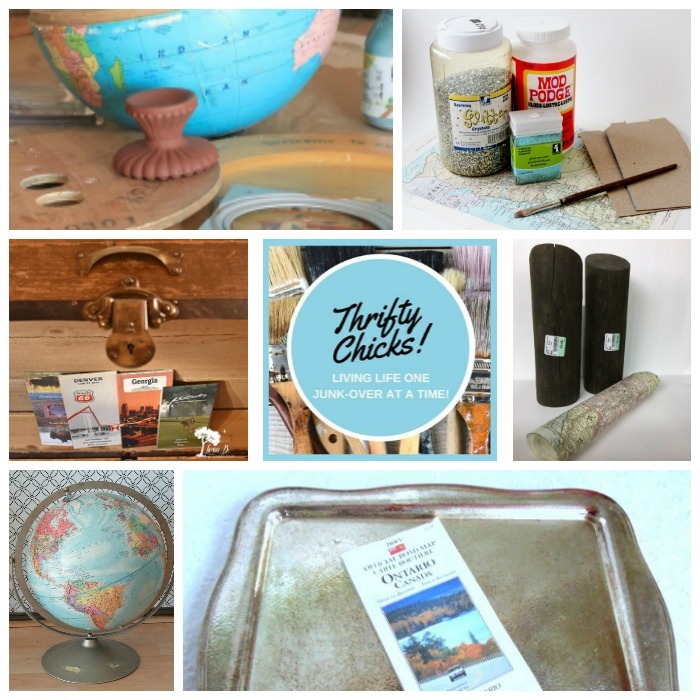 As I mentioned above, this month the theme is world globe and/or map upcycle. 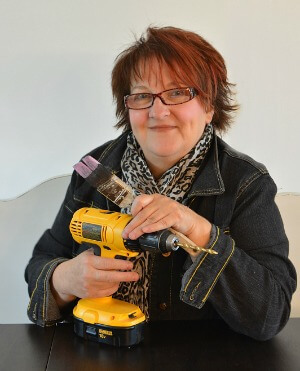 These are the products I used to make them, minus the red and green burlap ribbon. I found plaid ribbon I liked much better. 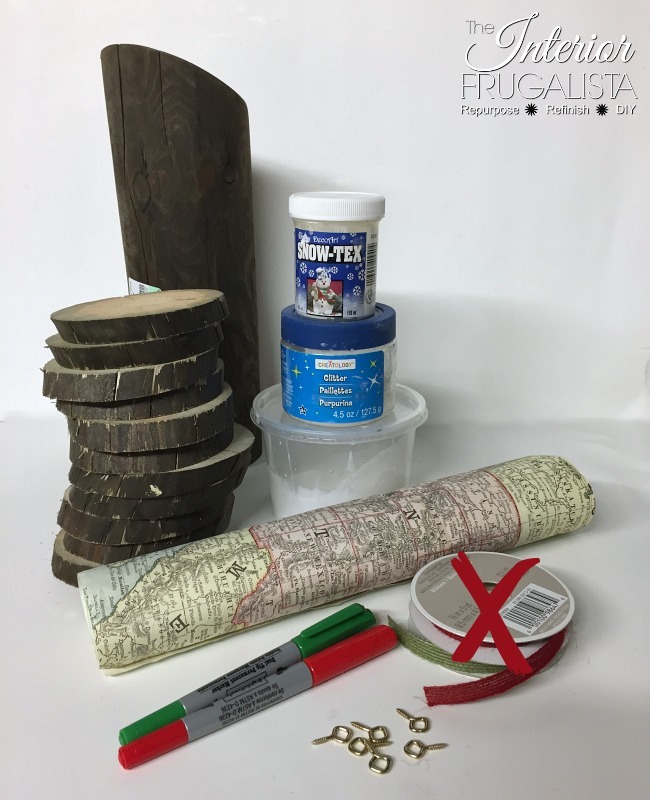 At the end of this post, I've included a materials list for your convenience. 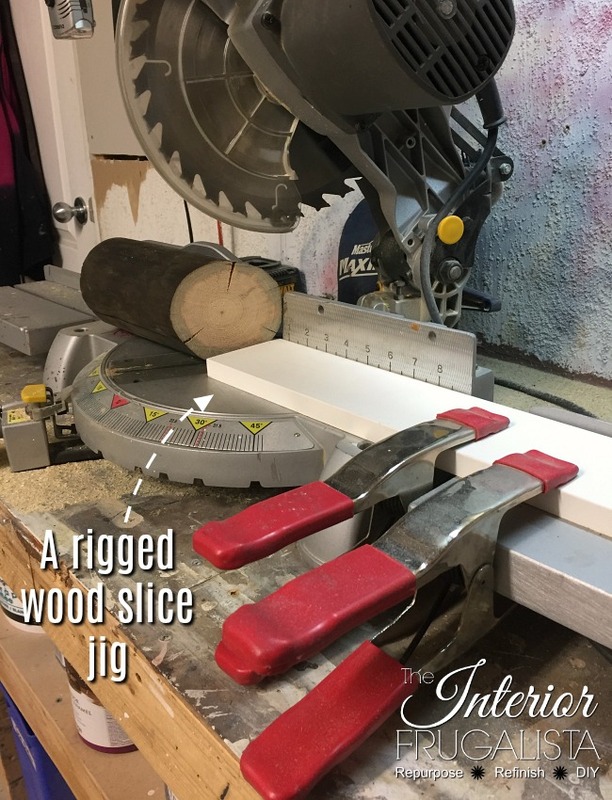 To get a uniform thickness for each ornament we made a simple jig using a piece of melamine mounted with clamps onto the miter saw. Set at approximately 1/2 inch from the blade and at a 28° angle, echoing the angle already on the pine post, we cut a dozen wood slices. You can skip this step but because the treated pine posts were dark brown, I stained the back side of each ornament dark walnut to match the sides. 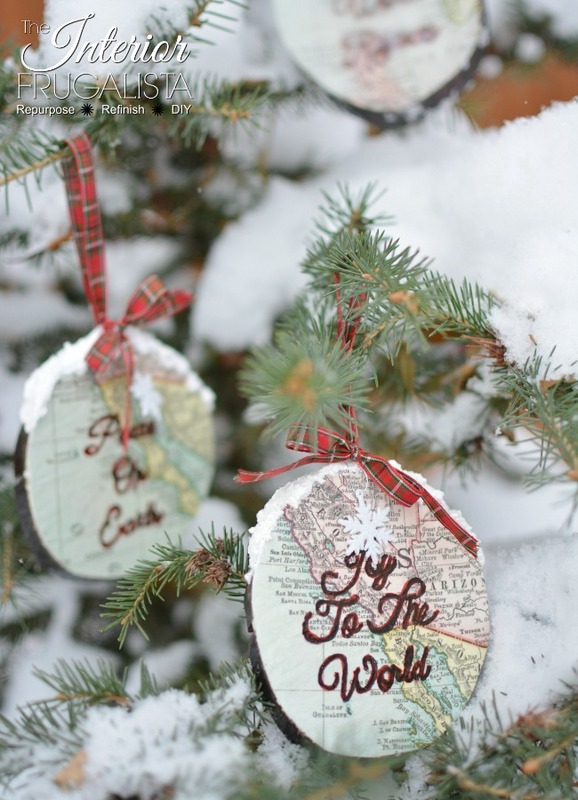 You'll notice in the picture below, the ornaments were not stained on the back when I decoupaged the maps. Learn from my mistake - stain the back of the ornaments first before starting this next step. 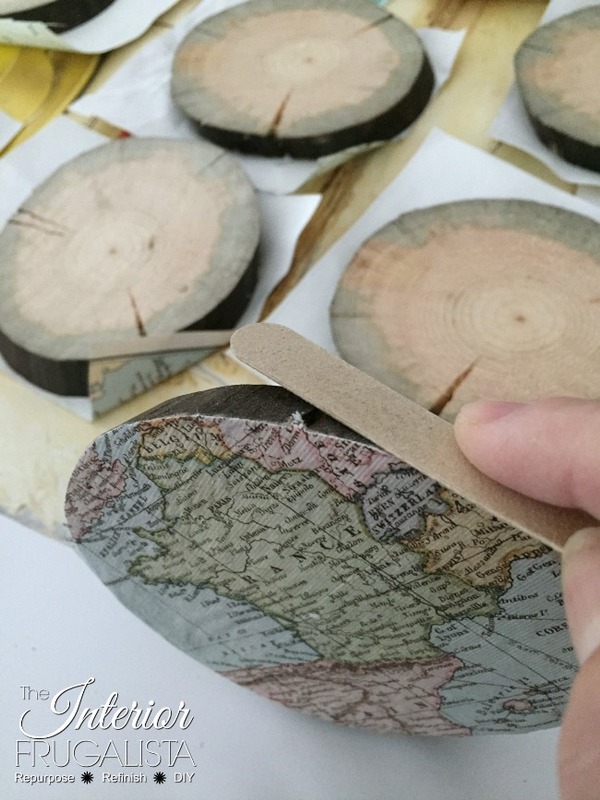 Once the stain is completely dry cut up a map (I used world map paper) into small pieces and decoupage them onto the front of each wood slice using Mod Podge and a foam brush. 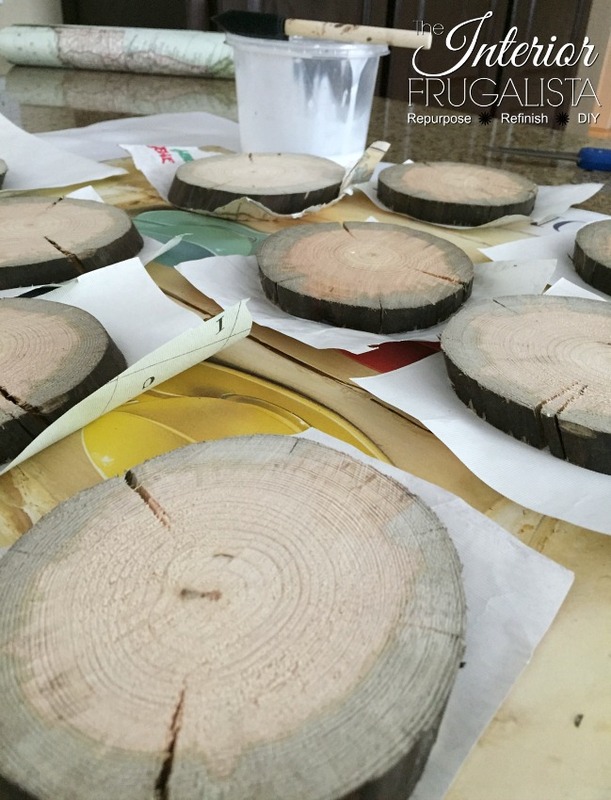 Once dry, use scissors to cut the paper around the perimeter of the wood slices. With an inexpensive emery board (I got mine from the dollar store), file the edges of the paper working from the top (papered side) down. 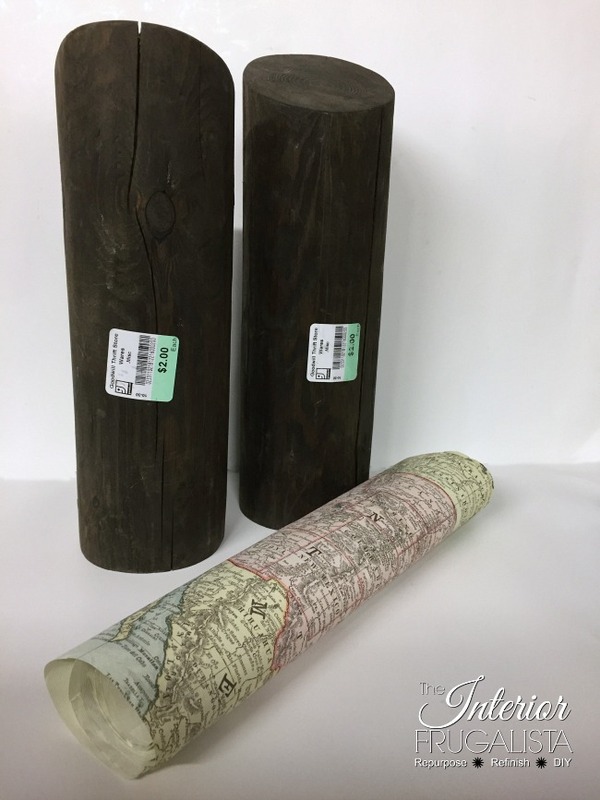 Apply a thin coat of matte Mod Podge over the map to protect the paper. To add a verse to the maps you have three options. Unfortunately, I don't have a handy die-cut cutting machine and so I had to apply mine using an image transfer technique. 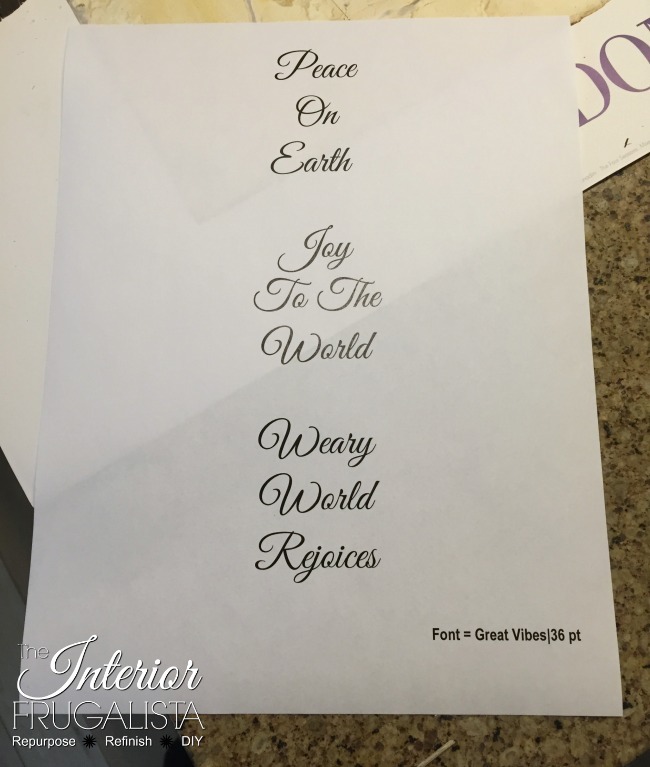 Create the typography verses in a Word document using the Great Vibes font in a 36 point size and print the sheet. Cut out each verse and center them over the map wood slices. Slip a piece of carbon or graphite paper underneath and trace the verse onto the map. I used my other hand to hold the verse down while I traced but you could use low tack tape. Go over the verses with a fine point Sharpie marker in the color(s) of your choosing. On a test ornament, I tried a gold metallic marker but it looked lost on the map. Next, I used a bright red marker thinking it would pull the red from the plaid ribbon and pop. Wrong. So in my infinite wisdom, I decided to go over the red with a green marker for added dimension. I'm not overly thrilled with the results but I had no more map paper left so I just went with it. Using a die cut cutting/embossing machine and contact paper, create a stencil and paint the verse on. I would suggest protecting the paint once it dries with a thin coat of matte Mod Podge like I did with my Sharpie option. Using a diet cut cutting/embossing machine create a sticker using self-adhesive vinyl. This would have been my preferred option had Santa fulfilled my Christmas Wish List the last couple of years. Something tells me I must be on his naughty list. Poke a hole in the top of each wood slice with an awl and screw in a small eye hook. Using an artist's pallet knife, apply Snow-Tex onto the top of each wood slice and let a little drip over the edge onto the map for a realistic look. While it's still wet, sprinkle glitter over the snow, letting the excess fall into a dish to reuse again later. Tie a mini glitter snowflake onto the eye hook so it hangs just above the verse. Loop 1/2-inch wide plaid holiday ribbon through the eye hook and tie a small bow. As promised at the top of this post, I've included a materials list for your convenience. Here is another wood slice idea that may interest you. 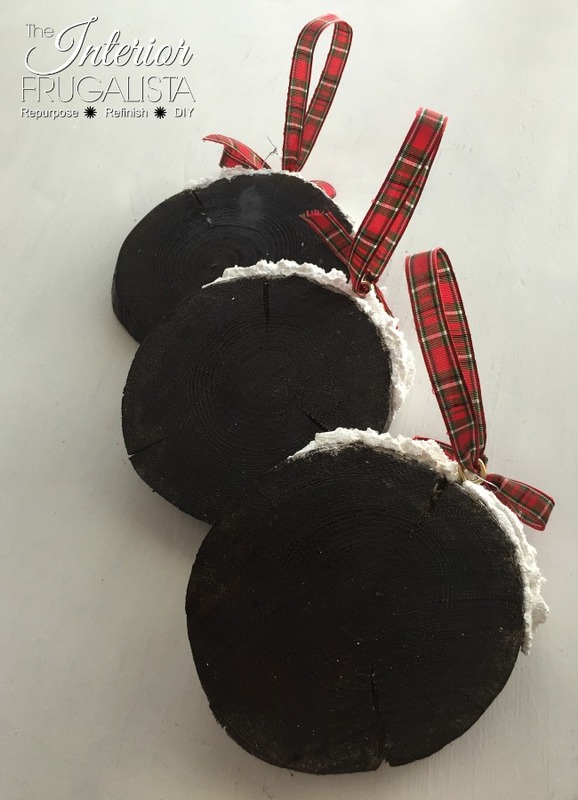 Two years ago I made fun Wood Slice Holiday Coasters from the branches of a fallen tree in our yard. 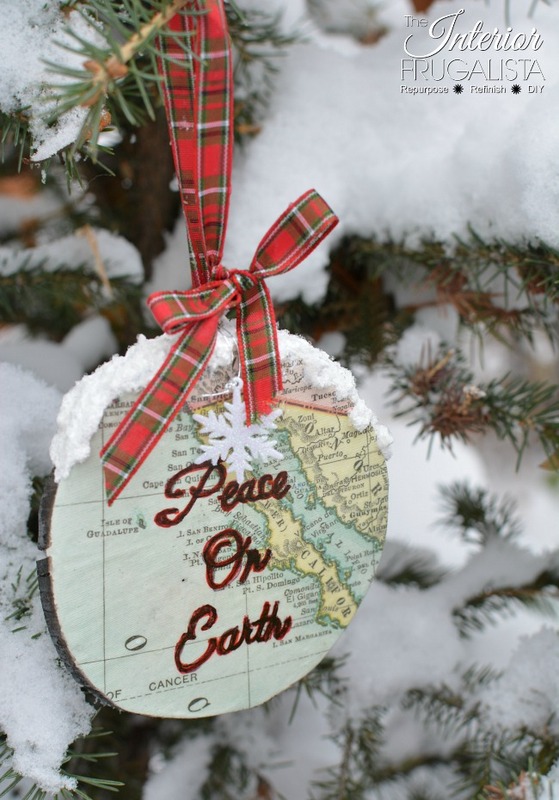 If you enjoyed these handmade Wood Slice Map Ornaments, please share them with a friend and/or save them on Pinterest. 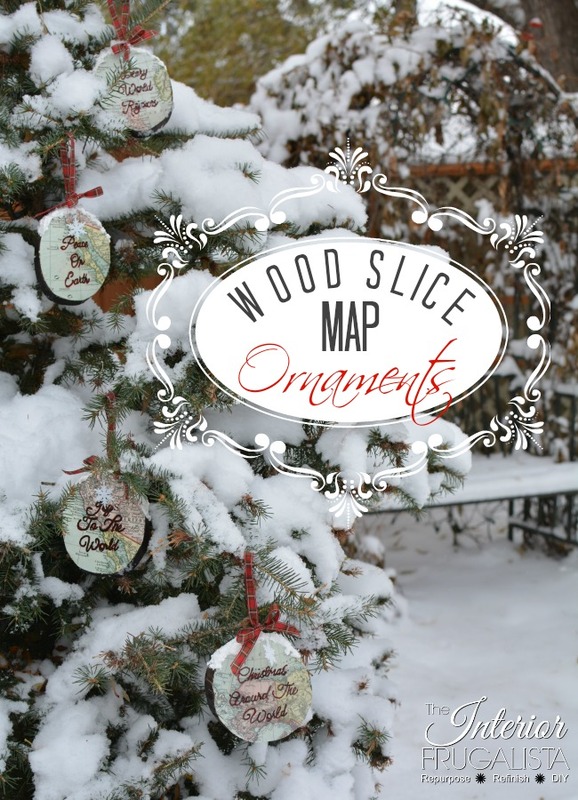 If you are unable to DIY wood slice map ornaments, I found a few ready-made options you may like. 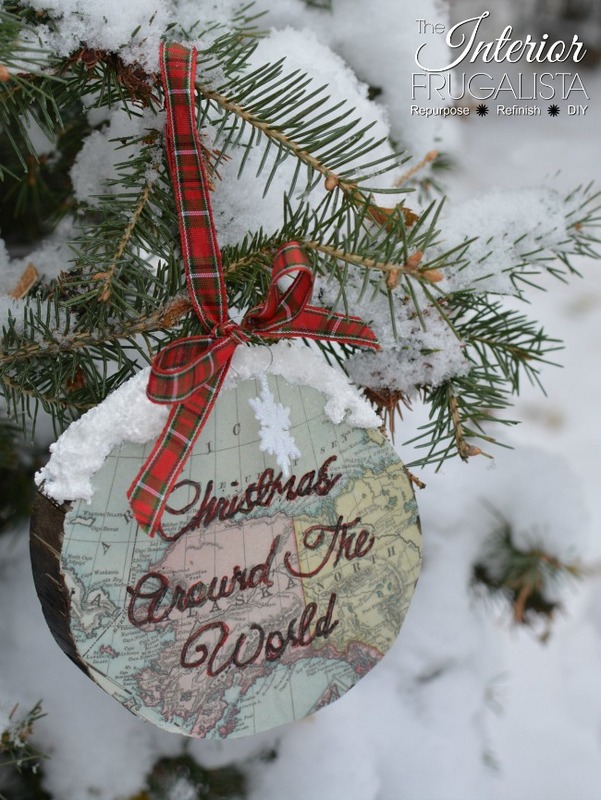 Please join me in visiting my friend's blogs to see what they did with either a globe or map.